This Workshop is for engaged couples and their friends and family who use Facebook, or/and have a wedding blog or website. Also, vendors are welcome of course. 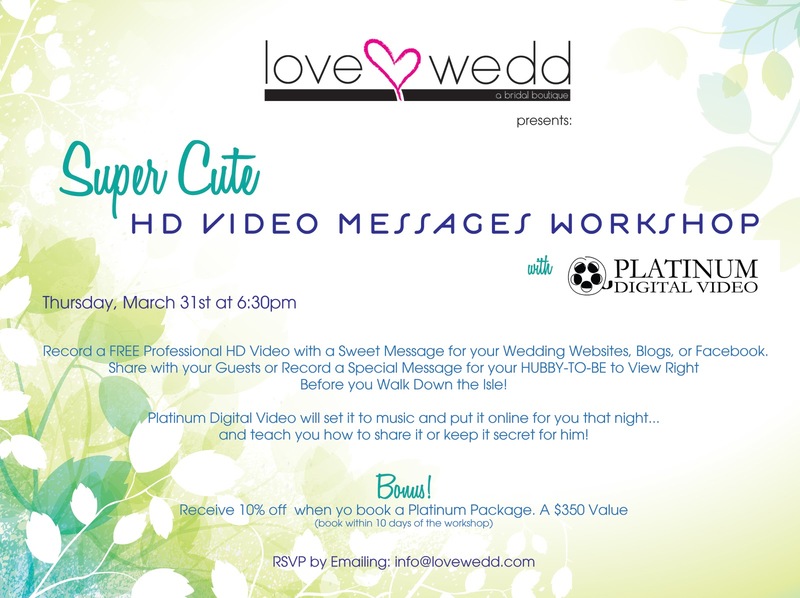 Our next Love Wedd workshop will be Thursday, March 31st at 6:30pm. We are going to teach people how to upload and share videos on the web. It is basically a little specialized class in social media. It is really easy to upload and share a video but there are small things you need to know to make it look right. You can make the videos different sizes and different resolution...depending upon where you plan to post the video. There are also different websites and different ways to upload a video. 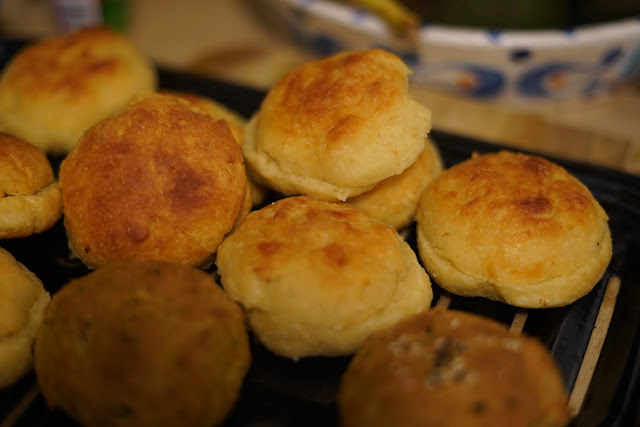 This is what we will touch upon. We are going to teach by example and plan to shoot a few short videos as examples. These videos will be "video messages" We will use our HD SLR camera and film with a very shallow depth of field so that the only the person giving the message will be in focus. It will be lit from the front and the back so that the person speaking with glow a little bit. This will look professional and beautiful. We will provide some sample scripts and also put some music behind the message. We think it will take about 5 minutes to film, add music and upload the video. Then we will work on teaching how to upload and share it online. An example of a "message video" would be a bride speaking directly to her friends and family who have received invitations to her wedding. It would be a short message that could be either posted to her Facebook page, wedding website or wedding blog. Another example: These days many people write a letter to their fiance to be read while they are getting ready to walk down the aisle. This message can be used as a sort of live version of the letter. But you can decide upon the content of the message you would like to record and upload. You can even choose the music. So if you, or someone you know would like to learn the social media basics (and a little more) of video...this is a perfect class for you. It will also be fun to do the message videos (bring your makeup). Check back to this blog post in a couple of days to see a sample "message video"
The storyboard above is a few stills taken from the video we shot of Peter & Haritha's wedding. 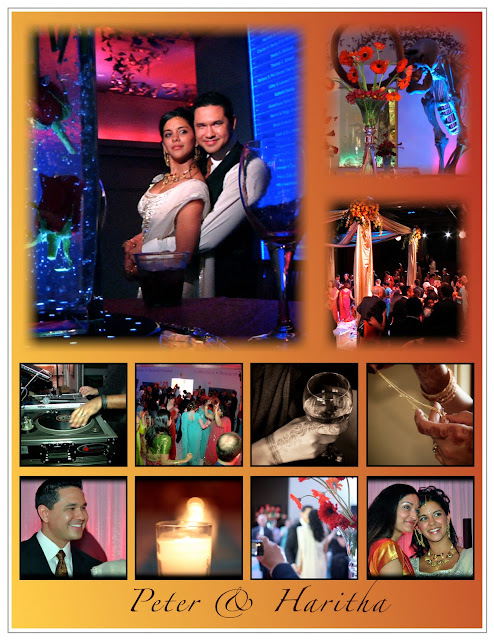 If you haven't seen Melissa's blog post about Peter and Haritha's wedding, you will want to check it out too. 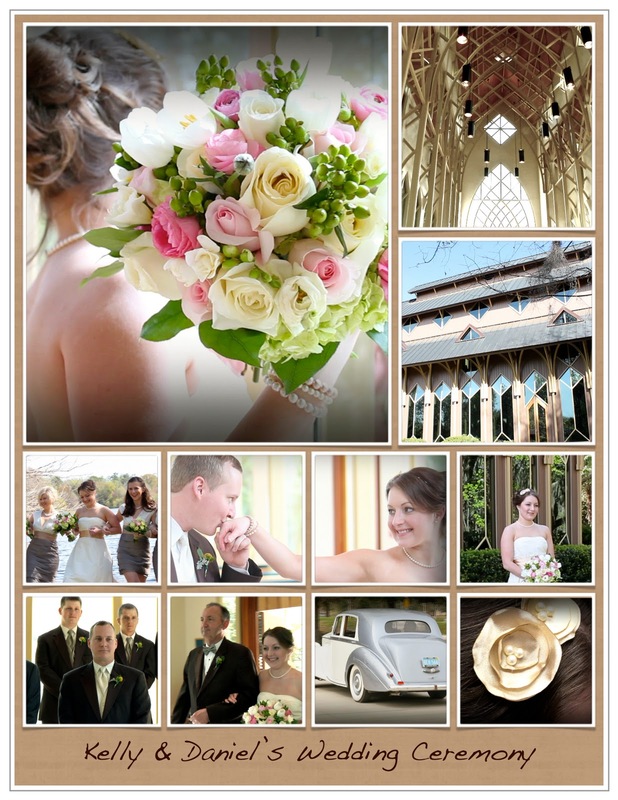 Verve Studios took some amazing photos that you don't want to miss. 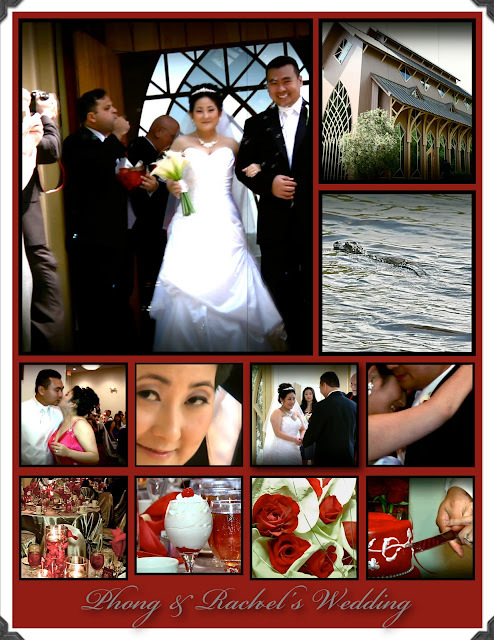 While you are here though, check out the 50 second Platinum Digital Video wedding teaser and the 14- minute highlight video. They are shot in HD and look like film. 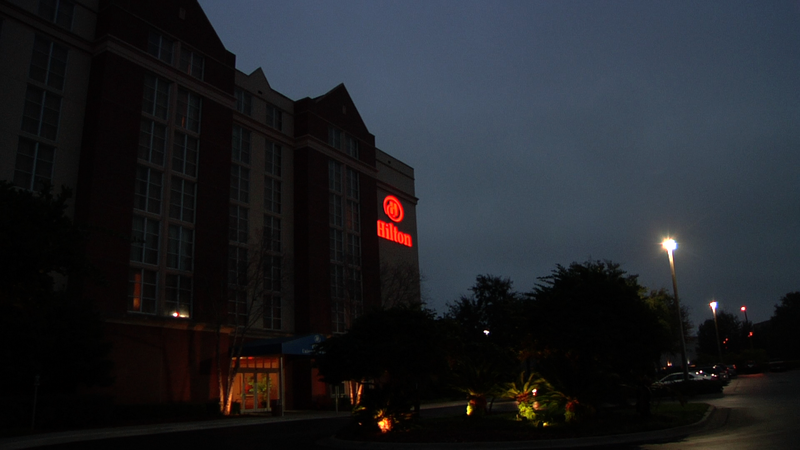 We first filmed the morning prayer ceremony...arriving at the UF Hilton at 7am. Following the prayer ceremony, we joined Haritha and her family and the bridal party in the Presidential Suite of the UF Hilton Hotel. Here we captured some of the beautiful getting ready scenes. Candies Limosines provided 2 enormous white busses to take wedding guests to the Hippodrome State Theater. The theater was transformed by Keith Watson Productions, into an alter covered with shimmering gold and red fabrics adorned with flowers. Here, Peter and Haritha had the final wedding ceremony of the 4 day wedding. There were lots of smiles around the audience of the theater as the newly married couple each poured large plates of rice and petals over the other's head for good luck. 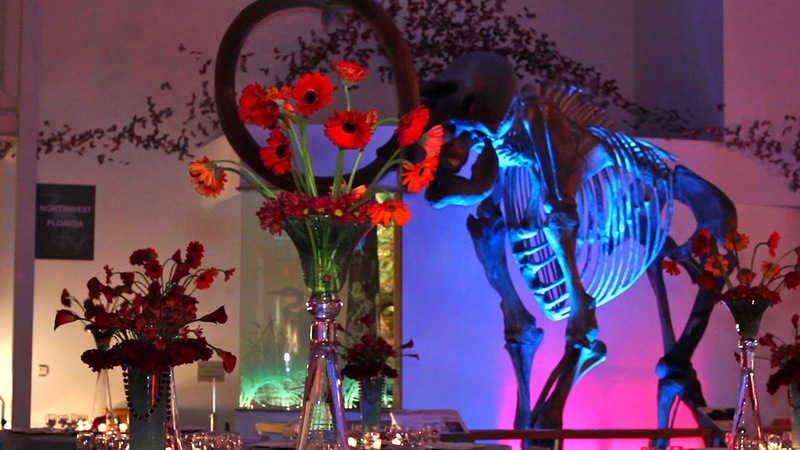 Following the wedding, everyone headed over to Gainesville's Museum of Natural History. I know the museum well as every summer I take the kids to the "kids room" and we spend lots of time exploring the butterfly garden, the cave and the simulated thunderstorms over the boardwalk. So when we walked in with the cameras to take some shots of the room, I was stunned at how the museum was now a glittering and glowing reception hall. 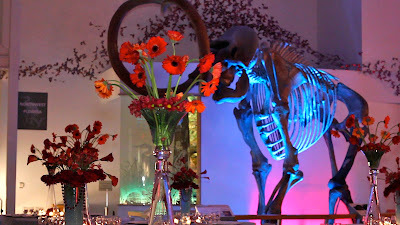 Even the huge Prehistoric Mammoth skeleton that looks so, "museumy" during the day, was lit up with blue and pink lights. I half expected it to come and join the party...and it was quite a sight to see behind towering red flowers. During cocktail hour Gosia and Ali provided the musical entertainment. I thought it was a CD until I walked back there to film and was quite surprised to see that it was live music...just flawless. I have seen Gosia playing classical flute with the Gainesville Orchestra and she is also my kid's music teacher. She is a gem of their school and is famous there for her wildly successful Christmas Concerts. I digress...As always, DJ Jarad of G-Nys Entertainment lead the party with a smooth confidence. The mood was joyful and even the vendors were all smiles all evening. The wedding was smooth and went off without a hitch...cudos to wedding planner, Melissa, of Masterpiece weddings for that. 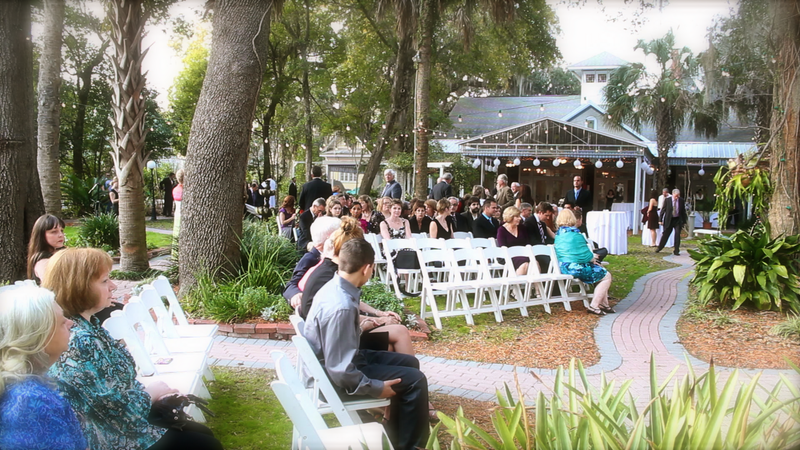 Sometimes we are hired to just film the wedding ceremony and this is Kelly and Daniel's beautiful ceremony at the Baughman Center on the UF Campus in Gainesville. We were there for 2 hours to capture some pre and post ceremony also. 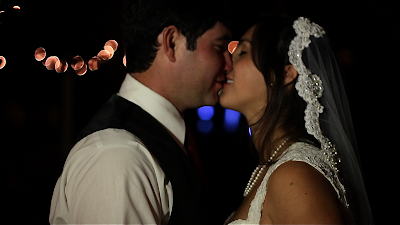 We filmed the wedding with HD SLR camera and a Panasonic HMC in HD. Here is a short video of a few shots of the morning ceremony. I took out the audio and put some film effects over it so that it looks like it was shot with an 8mm film camera. We set it to one of her favorite songs, "I'm Yours" by Jason Mraz. Kelly gets the Full Length video on a DVD and we used wireless mics so that they can be sure to hear the vows. That is always sketchy at the Baughman Center. But the mics made the vows crisp and clear on the Full Length Video. Here is a little blog post about Ana and Chris's wedding. We used stills from the video to tell the story. We also included the 2-minute video montage of the evening that closed Chris & Ana's full length video. Saturday was one of those perfect Florida late-winter days. The sky was as blue as can be and the sun shone gently over the trees of Sweetwater. The courtyard was filled with with friends and families. Lights were strung in the trees and fountains bubbled as everybody took their seats and the bridal party gathered to walk down the winding aisle. 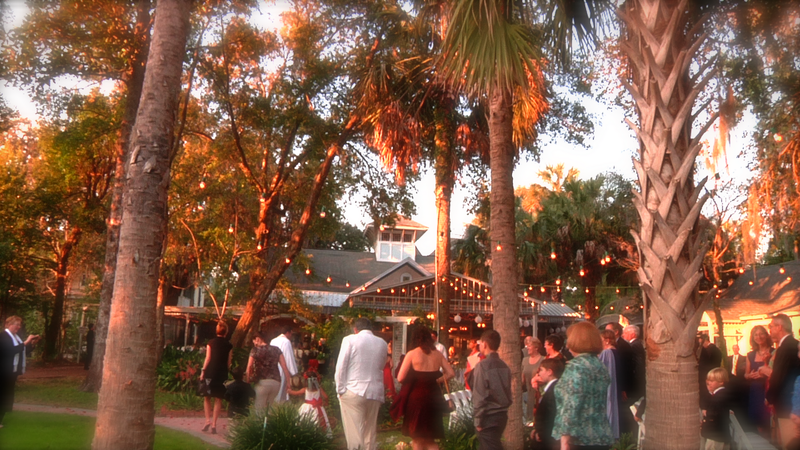 Ana and Chris had such a beautiful wedding at Gainesville's Sweetwater Inn. We were honored to be chosen to film their wedding for them and enjoyed editing it too.